The field of Ocular drug delivery is one of the interesting and challenging endeavors facing the pharmaceutical scientist. The most frequently used dosage forms i.e. ophthalmic solutions and suspensions are compromised in their effectiveness by several limitations, leading poor ocular bioavailability. In situ hydrogels are instilled as drops into the eye and undergoes a sol to gel transition in the cul-de-sac, improved ocular bioavailability by increasing the duration of contact with corneal tissue, thereby reducing the frequency of administration. The purpose of the present work was to develop pH-triggered an ophthalmic drug delivery system using combination of gelling agents with different mechanisms for in situgelation of Moxifloxacin hydrochloride, a fluoroquinolone antibiotic. In situ gels were prepared by simple dispersion method using carbopol along with HPMC in factorial design and then evaluated for pH, gelling capacity, drug content, rheological, gel strength and in-vitrodiffusion studies and comparison with marketed eye drop formulation along with statistical studies. 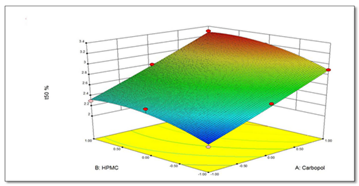 Among formulation batches F1- F9; optimized formulation F6 imparted sustained release property to the gel formed in situ and effective other evaluation parameters. The developed formulations were therapeutically efficacious, stable, non-irritant and provided sustained release of the drug overcoming convential drawbacks leading to better patient acceptance. Hemalata Dol, Sanket Gandhi, Dinesh Pardhi and Namrata Vyawahare. Formulation and evaluation of in situ ophthalmic gel of moxifloxacin hydrochloride. 2014; 3(5): 60-66.